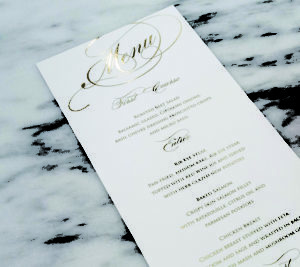 We offer 5 different types of printing methods! Digital Printing is the most cost effective method. The ink is flat to the paper and we use the highest quality paper stocks. You are not limited by the number of colors on a piece. 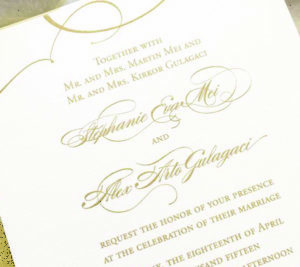 We also offer digital WHITE, GOLD and SILVER printing! Common printing method used for stationery. The ink is raised up above the paper and has a slightly shiny appearance. 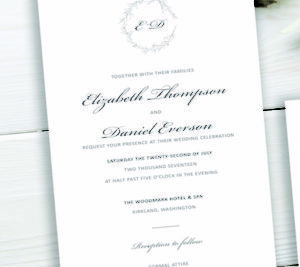 Thermography printing is priced per color. 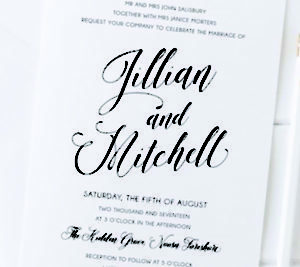 We team up with several local calligraphers who specialize in a wide range of styles for your guest addressing or if looking to add a touch of hand written text to your invitation!